What is this thing called literature? Why should we study it? And how? Relating literature to topics such as dreams, politics, life, death, the ordinary and the uncanny, this beautifully written book establishes a sense of why and how literature is an exciting and rewarding subject to study. Bennett and Royle delicately weave an essential love of literature into an account of what literary texts do, how they work and what sort of questions and ideas they provoke. The book’s three parts reflect the fundamental components of studying literature: reading, thinking and writing. 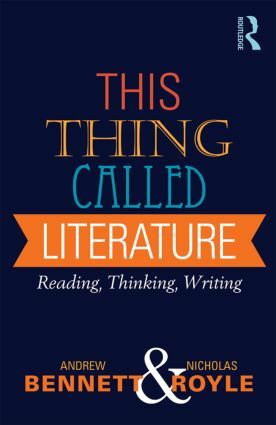 The authors use helpful, familiar examples throughout, offering rich reflections on the question ‘What is literature?’ and on what they term ‘creative reading’. Bennett and Royle’s lucid and friendly style encourages a deep engagement with literary texts. This book is not only an essential guide to the study of literature, but an eloquent defence of the discipline. ‘Some versions of Cole Porter’s ‘What is This Thing Called Love?’ open with references to the humdrum. There is, however, nothing remotely humdrum about Bennett and Royle’s This Thing Called Literature - a playful, pleasurable, passionate defence of ‘what is strange and slippery about literature’. In light and lucid prose, and with plenty of well-chosen examples, the authors offer a timely and provocative introduction to literary study and creative-critical response.’ - Neil Badmington, Cardiff University, UK. Andrew Bennett is Professor of English at the University of Bristol, UK. Nicholas Royle is Professor of English at the University of Sussex, UK.